Been 50% of the teams to participate in the Championship Games, and won over 57% of those games! Been 54% of the teams to participate in the Semi-Finals, and won 50% of those games! Of course, we cannot take credit for the tremendous talent of these incredible NCAA Division I teams. However, champion-level teams know the importance of health in athletic performance, and they invest in our Athlete Electronic Health Record (EHR) technology to support their health management processes! As we’ve already told you about the many benefits of making the switch to an EHR, (i.e. improved athlete health, better communication, decreased paperwork, and increased productivity), we’ll skip ahead to what makes Presagia Sports so unique. The NCAA reports that in soccer, concussions make up about 5.5% of men's injuries and 9.2% of women's injuries. With concussions, recognition and immediate response after injury is instrumental to preventing further damage. Presagia Sports is fully equipped with a concussion assessment test, which means you can quickly assess the health of your athletes on the sidelines, ensuring they are cleared to play post-injury. Presagia Sports designed a Quick Treatment feature with the end user in mind: the very busy AT or Sports Medicine Professional! Instead of having to open a new record for each treatment, the user has a single screen where they can enter multiple treatments for multiple athletes. When done, they can just click save, and treatment records will automatically be created and added to each athlete's EHR. It’s as simple as that! Presagia Sports allows you to run standard and customizable ad-hoc reports that enable you to gain insight into particular aspects of your program, including the frequency of injuries, where they are occurring, and so forth. Use these insights to strengthen the health of not just your athletes, but of your entire team or organization! Interested in learning more about how our EHR will simplify your daily life? Here’s Part I and Part 2 of our blog series on the subject! 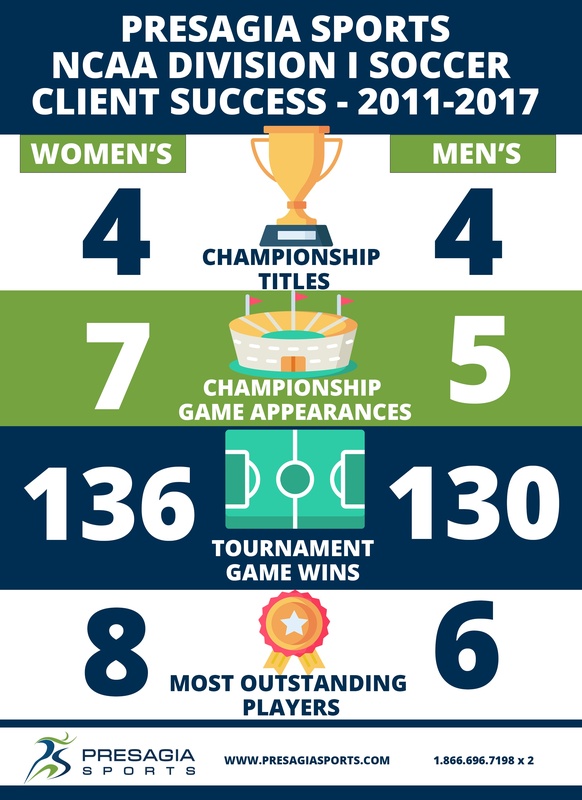 On behalf of the entire Presagia Sports team, we’d like to congratulate our incredible clients for their continued achievements and successes in the NCAA Division I Soccer Championships!